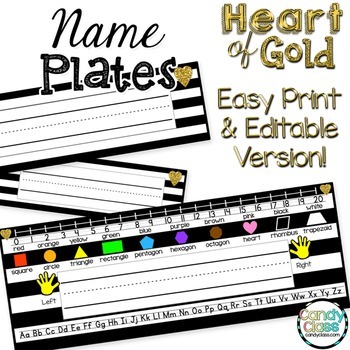 Not only will these heart of gold name plates add some bling to your classroom, but some of them include educational references for your students that can be used for writing, math, handwriting, and more! 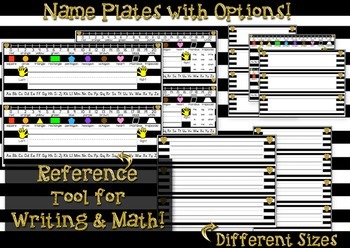 Additionally, it includes editable pdfs for you to type the student's names on these name plates! •Two large name plates with reference tools. One includes sight words and the other does not. •Editable PowerPoints with the name plates. Includes one ready to go with century gothic (without the handwriting lines) and one with the handwriting lined font (but you will need to download the font first. I included the link to the font in the resource. It is free download for personal use). •Large Plates with reference tools- 4 in. x 10.75 in. •Large Plates (name only)- 2.5 in. x 10.75 in. •Small Plates- 2.25 in. x 7.25 in. Please note, this resource, Name Plates, is in a zip file. It includes the editable names plates in editable PowerPoints and the name plates made ready for printing in a non-editable pdf. These name plates are for personal use only and one license is for one classroom. Multiple licenses may be purchased for a discount. For extra discounts on district licensing, please contact me at teachcandyclass@gmail.com.